Its questions as to why Nando’s would ‘borrow’ a giant mango have remained unanswered… until now. On Thursday morning Nando’s will launch its delicious new flavour – Mango and Lime – alongside an eight-metre replica of the Bowen Big Mango. Described as the most dynamic duo since Batman and Robin (but without the tights), Mango and Lime has all the zing that Nando’s fans love, but less of the PERi-PERi kapow. Known for its addictive flame-grilled PERi-PERi chicken, Nando’s is launching Mango and Lime to cater for people who don’t always want hot and spicy. Fans of Nando’s in Melbourne are invited to come and try the new Mango and Lime flavour between 8am and 2pm in Federation Square where Nando’s will be giving out chicken tenders basted in the zesty new flavour and grilled on-site. Mango and Lime will be available in Nando’s restaurants around Australia from Thursday. And for those who enjoyed ‘Mango Gate’ there will be an enormous eight-metre replica of the Bowen mango, which is bound to inspire some creative photography. We’ll also be introducing the Giant Mango to a Giant Lime in the hope that they’ll live happily ever after in Nando’s Restaurants across Australia. Chairman of Bowen Tourism, Paul McLauglin, who was instrumental in facilitating Nando’s Big Mango heist, will also be celebrating with Nando’s in Federation Square. residents as a small gesture of thanks for their good humour and support. Well, there you go. 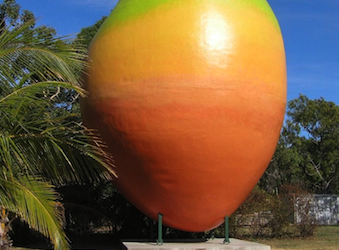 As many of us suspected, the case of the missing giant mango from Bowen was a PR stunt. The brand behind the stunt is almost more surprising than the fact that the majority of the Australian media fell for it in the first place. Nando’s Australia has claimed responsibility for the theft (the brainchild of advertising agency, Banjo) with its PR manager Jude Leon confirming Nando’s will be making an announcement later this week regarding the stunt. We speculate that this announcement may involve chicken, mangoes and maybe even some peri peri. Bowen’s Tourism Board has reportedly been involved in the stunt from day one, with its chairman, Paul McLaughlin, artfully dodging questions from the media around his involvement in the missing mango throughout the week. The mango is currently sitting in a paddock with a “couple of tarps” over the top of it, and Leon is adamant it will be returned unscathed to the people of Bowen on Friday. “As you can imagine as hard as it is to steal a 10-foot, 10-tonne giant mango in the middle of the night, it’s even more difficult trying to hide it,” she says. But not everyone appears to be too impressed, with this the presenters on Seven’s Sunrise refusing to name the brand responsible for the hoax this morning, while comments on Queensland’s Daily Mercury website about the stunt would lead you to believe some locals are not that happy either.